The “CFI Feature" will feature the Chief Flying Instructors of four flight schools in India: IGRUA, NFTI, Chimes Aviation Academy, and GMR-APFT (in no particular order). The first two institutes are managed by CAE, to a larger extent at NFTI due to CAE’s 49% ownership. The last two are academies that are more flexible, offering an exclusive PPL as well. All schools, save Chimes, have some foreign component in them, and all are dominantly Diamond Aircraft (DA-40 and DA-42) operators, except Chimes which operates Cessna 172s and a Piper Seneca IV: the only flying Seneca in the country, as of today. GMR-APFT has diesel engine Diamond DA-40s, and IGRUA will soon be a full-fledged, first of its kind aviation university. NFTI is known for its IndiGo Cadet Pilot Program. This week, we focus on IGRUA’s CFI, who retired from the Indian Air Force (IAF) as an Air Commodore. He served the Air Force for 34 years, leaving the service on the 31st of March, 2010. He has the distinction of undergoing the Flying Instructors Course as well as the Experimental Test Pilots Course, after which he instructed at the IAF Test Pilots School on all types of fixed wing aircraft from trainers to fighters to medium tactical transport aircraft. 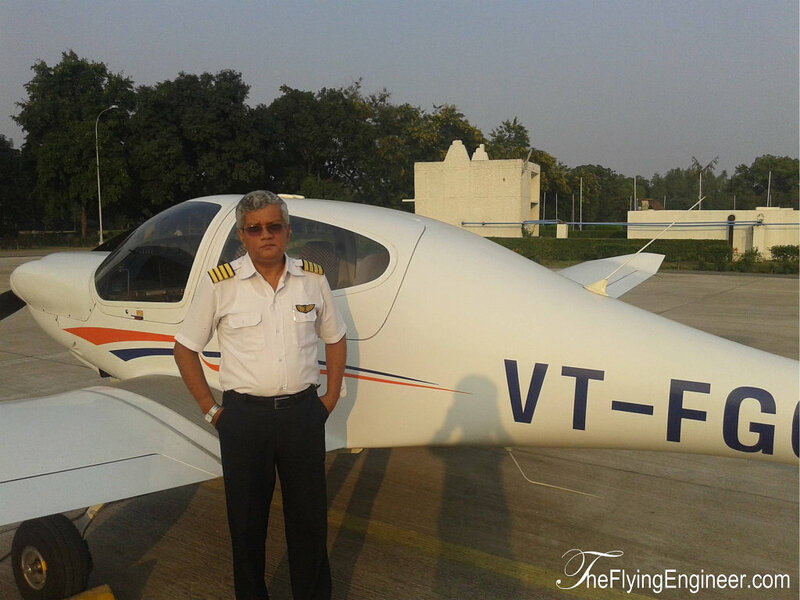 With more than 5000 flying hours to his credit, TK Chatterjee is now the Chief Flying Instructor at IGRUA. As the head of flying training at IGRUA, we get to better understand the CFI. 1. What, according to you, are the traits that must be exhibited by a flight instructor? TK Chatterjee: All round knowledge about aviation, very good basic flying skills, command over language, eye for detail and the ability to analyse the student’s mistakes and suggest effective corrective measures. 2. Are there “natural", born instructors (those who have a natural flair for teaching), or is it something that can be picked up by anybody? TK Chatterjee: Being “natural" always helps. However, it is not difficult to learn to teach provided such learning is done in an organised manner from specialists. In the IAF a pilot is nominated for the QFI course based on his flying abilities, when he has around 700-800 hours on fast jets. The course itself is tough and performance in the course has effects on the future career of the pilots. Further, performance as instructor is also assessed periodically and such assessments have implications on the officer’s career. So the whole game is lot more serious. In civil aviation, a person with 300 hours on simplest of aeroplanes can qualify to become an Asst Flying Instructor. 3. What is your take on General Aviation in India? TK Chatterjee: Industry prediction is that this sector is supposed to grow at 10% rate annually. Hence the potential is enormous provided the economy continues to grow. The scope is not just for aircrew but for all associated segments too like airport staff, maintenance staff, MRO services etc. The metros are already well connected, so the more we connect the hinterland of the country with the mainstream; more will be the growth in GA. Hence satellite airports in metros and airports in second and third tier cities need to be developed first for this segment to grow. Secondly, the regulatory framework is primarily aimed at scheduled operations which are not always applicable to GA. The two should be looked at differently. Thirdly, regulatory apparatus has to evolve an effective monitoring methodology for about 150 and growing number of GA operators. 4. Your opinion on fixed wing flying training in the country? TK Chatterjee: Fixed wing flying training is imparted by about 40 institutions in the country. Since aviation is cash intensive business, most of them have very limited assets. Hence, quite naturally, there is a clash between commercial interests and quality of training. Small enterprises are not very clear whether to treat trainees as “students" or “clients". Failures are not heard of in this industry! Bigger enterprises are in a better position to deliver quality due to volume of business. A centralised testing authority for issue of license will also help in standardisation of training. Most students (not all though) who take on civil aviation as a career, see it as a quick way to big money. Academics are not their forte and aviation not their first love. Hence when faced with subjects leaning heavily on technology, they falter. Also, since the best and the worst are rewarded with the same license at the end of training, there is no great incentive to do better. Once the civil aviation sector revives itself and demand for aircrew grows, there will be more competition and this aspect will improve. Staffing is another issue. Like the problem with teaching profession in every field, the best opt for avenues with better remuneration, which definitely is not teaching. Some use this industry to build up experience and move on. Ex IAF pilots who retire early and take this line as second career are the best bet, but most leave IAF without civil license or civil flying instructor rating and hence are not eligible. Airline industry is aware of loopholes in the system; hence their selection process for aircrew is designed to plug them. 5. If there is something you’d like to change in Indian aviation, what would it be? TK Chatterjee: The regulatory body wants to control every small thing in the aviation industry, but they have neither the human resources nor the technology to work at a pace that the industry demands nor are they willing to delegate authority. Hence everything slows down. A serious re-look is required in the working methodology of the regulatory apparatus of Indian civil aviation. Note: All views of the CFI are personal, and do not necessarily reflect those of the flight school / institute / academy. Hello Chaitanya, I’ve been to NFTI once. I’d love to visit again, let’s speak to CAE about that!  Many people I knew have left NFTI, sadly. Capt Ashwani’s thoughts will be up soon, please do say a hi to him from my side and show him this feature. Thank you!